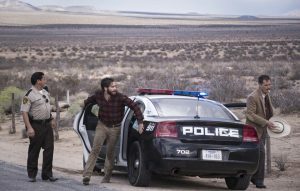 Nocturnal Animals (Spoiler Free Review): An unmissable film, that will grab hold of you and never let go. Your hands grip the smooth leather steering wheel, as your eyes glance away from the endless road towards the rear-view mirror, where you catch the reflection of your beautiful daughter sleeping on the backseat; strands of her amber hair are masking her face. Your stare returns to the road, but its unrelenting indefiniteness bores you, causing your gaze to again drift to your right. Your wife is also asleep, and moving one hand off the wheel, you begin to caress her tender white cheek. Like the moon, it is a source of pureness that eradicates the solitude of the night. Their crimson pupils dilating, as your car draws closer. Fashion designer turned filmmaker, Tom Ford’s second feature Nocturnal Animals, is a harrowing psychological drama that sinks its teeth into your soul and disperses its pristine-black venom into every crevice of your psyche; leaving you yearning for any form of solace as the credits trickle down the screen. The film, based on Austin Wright’s 1993 novel Tony and Susan, is a seductive concoction of aesthetic beauty and distress, that slithers its way through a narrative that will have you hooked from start to finish. This story-within-a-story structure, initially focuses on Susan Morrow (Amy Adams), a successful art dealer living a fragile existence, that consists of an emotionally distant husband (Armie Hammer) and a new exhibit that, despite its acclaim, gives her no sense of satisfaction. Out of nowhere, and with her partner away on ‘business’, Susan receives the proof of her ex-husband Edward’s (Jake Gyllenhaal) new novel, which is dedicated to her and called ‘Nocturnal Animals’ – a name he used to call her before she left him in ‘horrible’ circumstances. Mostly confining herself to her bell-jar-esque modern LA home, Susan begins to read the story over the next few days, which Ford uses to form the film’s internal narrative. It is a tale of brutality, in which the Hastings family (portrayed by Isla Fisher, Ellie Bamber and, surprisingly, Jake Gyllenhaal), driving in the night through the void that is West Texas, encounters a gang of rednecks, led by Ray (Aaron Taylor-Johnson), who force them off the road and proceed to harass, bully and assault them. The disturbing ramifications of the dramatized novel, are interlaced with moments from the present and flashbacks that provide more context surrounding Susan and Edward’s previous relationship. As the plot unravels, we soon begin to understand that the story that has been blotted in ink, has a startling parallel to real events. Ford, here, is channelling the voyeuristic style and mood of Hitchcock, lingering on his actors and capturing every expression with expert precision. With any film that involves static acts, such as writing or, in this instance, reading, there is a lot of pressure placed on the film to be energetic whilst also refraining from the absurd. The direction, editing and acting – most notably Amy Adams, whose role relies heavily on her ability to stare through thick rimmed specs – are always working cohesively to maintain a sense of intrigue in what could easily be the laborious. Because of Adams’ refined expressiveness, we consistently feel the horror, distress and isolation Susan experiences whilst she reads. There are even moments where silence envelops the scene, and we are not detached due to the sheer immersive atmosphere garnered by these three elements. The film, though, is not contained to the cold metallic artifice of Los Angeles, and when Ford chooses to delve into the interior novel he truly excels. It is at times excruciatingly tense, and the performances of everyone, especially Gyllenhaal’s devastated character and Michael Shannon’s role as a spluttering sheriff, are magnetic. The director seems to permeate every shot with the palpable taste of revenge and the grisly terror of the worst aspects of humankind, whilst, somewhat ironically, maintaining an almost aesthetic perfection. At times, the intrigue generated by this section of the film is so great, that it overshadows the exterior plot, and we crave to return to the hellish desert and its writhing daemons. But, we soon discover the stories are not two separate entities, and gradually Ford uncovers the chilling reality behind the fiction. There are, however, minor elements that are less successful. Ford’s depiction of the Los Angeles art scene, for instance, is a bit too detached from reality – during the film’s miscalculated opening credits, which I will not spoil. Ford chooses to grotesquely capture the, as Susan calls it, ‘junk’ obsessed culture of today, in a way that is unnecessarily provocative for it creates a tone that misrepresents the following film. There are also times where the plot becomes a little predictable, but ultimately the performances and visuals are so good that the narrative never loses its impact. These are faint specs of dust on what is ultimately a well-polished product. Often films are superficial: when interrogating the visuals displayed, we rarely find anything but a hollow husk, that may be entertaining yet lacks substantial depth. But, within Nocturnal Animals there are aspects of Lynch, Kubrick and even – if we are looking for a more contemporary influence – Nicolas Winding Refn coursing through the stylish veins of this drama/thriller. Ford has meticulously crafted an unmissably rich film, that is soaked in meaning, style and horror, and will grab hold of you and never let go.